Remember Dr. Strangelove. United States Air Force Brigadier General Jack D. Ripper (Sterling Hayden) sets off nuclear Armageddon to ward off the Russians who are responsible for the fluoridation that is attacking “precious bodily fluids.” The Kubrick classic was based on a book by Peter George called Red Alert or Two Hours to Doom. Now according to an article in the Times ("Amongt Gingrich's Passions, A Doomsday Vision," NYT, 12/11/11)New Gingrich is warning about EMP, electromagnetic pulse. The Times piece reports that Gingrich has worked with William Forstchen on historical novels and has written the forward to his doomsday thriller One Second After. “Millions would die in the first week alone,” the Times quotes Gingrich as writing in his forward. The idea is that a nuclear weapon hefted into the atmosphere “would set off a huge and crippling shockwave of electricity.” Like Jack D. Ripper Mr. Gingrich favors preemptive action. “We are on the verge of catastrophic problems,” the Times quotes him as saying. “I favor taking out Iranian and North Korean missiles on their sites.” When you think of it, doesn’t Gingrich look like a character out of a Kubrick film? He has the brilliance of the professorial Strangelove (Peter Sellers), suffers the delusion of Ripper and demonstrates the xenophobia of General Buck Turgidson (George C. Scott). 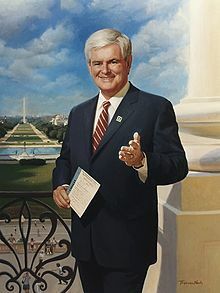 Gingrich is really a throwback to another era in which people named their children Newt and future cold warriors showed off their latest trophy wives to their congressional colleagues. Weapons of Mass Destruction? Fiddlesticks . Newt has bigger fish to fry.